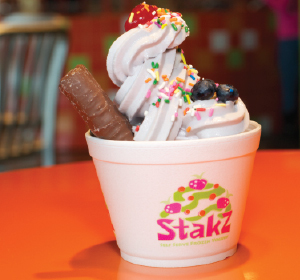 Since September of 2010 Stakz has been promoting good-tasting wellness with specially blended smooth and creamy frozen yogurt, crafted with care. The phenomenon of self-serve yogurt started on the west coast about ten years ago. It jumped to the east coast and has been successful on the both sides of the country. 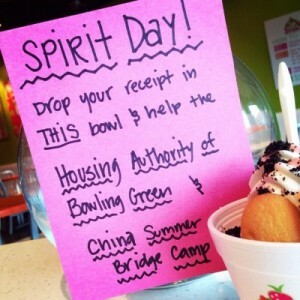 Owners Fred and Kathy Higgins observed this trend and decided providing this healthy treat for kids and adults alike would be a great idea for Bowling Green. So began the quest for a product that was a healthy alternative to ice cream with great taste. Stakz is proud to offer products made with the highest quality ingredients and using recipes specially blended for a smooth and creamy taste. In addition, the yogurt has the highest counts of beneficial live and active natural yogurt cultures which qualifies it as certified live and active cultures as well as real dairy frozen yogurt. At Stakz you are getting the real deal! That means that with Stakz, you are getting the healthiest form of yogurt possible. To be mindful of our customers with dietary concerns, we offer fat-free, low-fat, sugar-free, gluten-free, and even dairy-free options. If you have questions about our flavors, one of our friendly staff members can give you some great suggestions! Adding new products, toppings and expanded services continues—as does the pure joy of watching children come to Stakz and have a ball creating their own frozen yogurt masterpieces. Stakz has become known as a great place to hang out for the whole family—our bright and cheery atmosphere complimented by our bright and cheery staff! So popular, that we doubled our space in 2011, adding the “garage” to accommodate more people and parties. Stakz is the perfect destination after sports events, church groups, and school events because we strive to create a feel good experience! Not only is Stakz the place to get your favorite frozen yogurt treats, but we strive to be a great community partner as well. We want to help schools and non-profit organizations raise much needed funds. To that end, we want to extend two offers to help with fund raising. For one weekday, we will donate to your organization 10% of Stakz sales from your friends and supporters. In addition, if you need gift certificates for a fund raising event, please stop by the store. We want to make this community a great place to live—together we can make it just that!